Three layers of chocolate cake filled with truffle (whipped ganache) filling, crumb coated with truffle & glazed ganache (a chocolate glaze made with chocolate, heavy cream & butter). Rich and creamy New York style cheesecake with a cookie crust. Decorated with whipped cream rosettes. 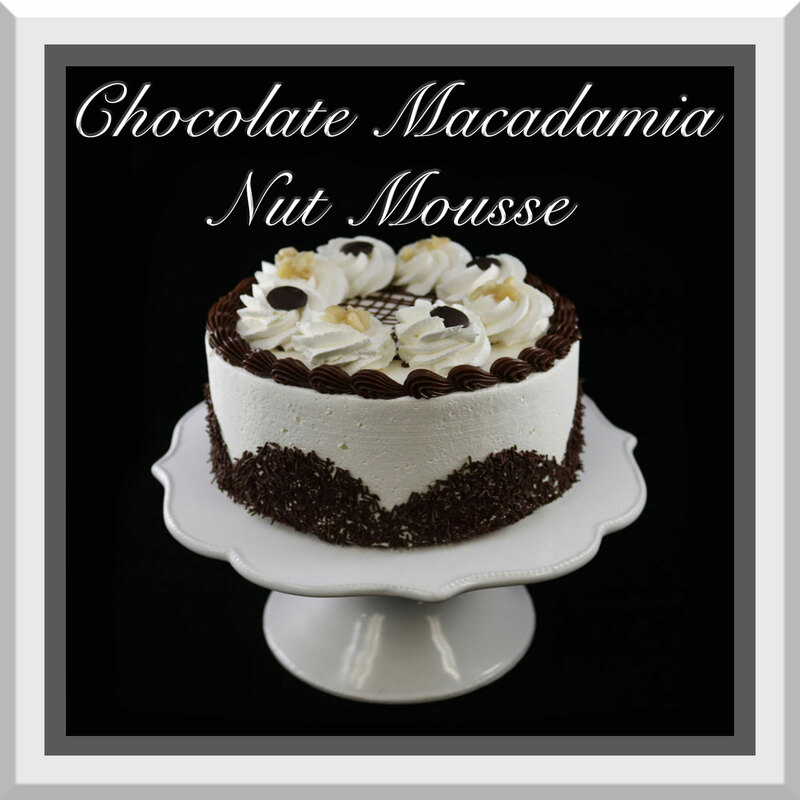 Three layers of chocolate cake layer with a chocolate cream cheese macadamia nut mousse. 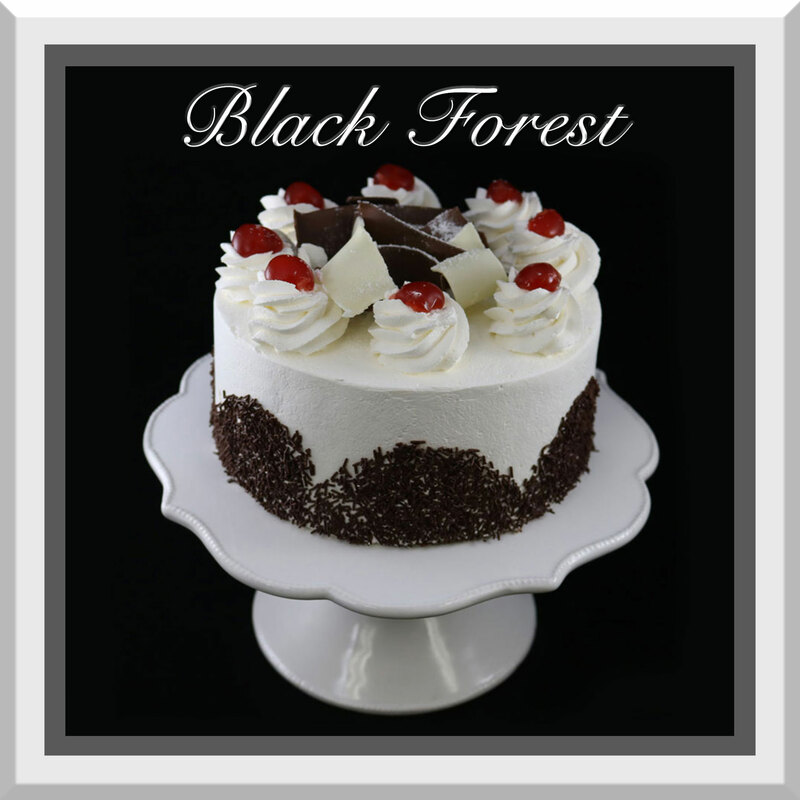 Cake is iced with whipped cream and decorated with chocolate sprinkles on the side and top has a chocolate fudge drizzle, chocolate pieces & chopped macadamia nuts. Two layers of vanilla and one layer of chocolate cake iced with a coffee flavored European buttercream. Cake is decorated with chocolate sprinkles, fudge icing & chocolate coffee beans. 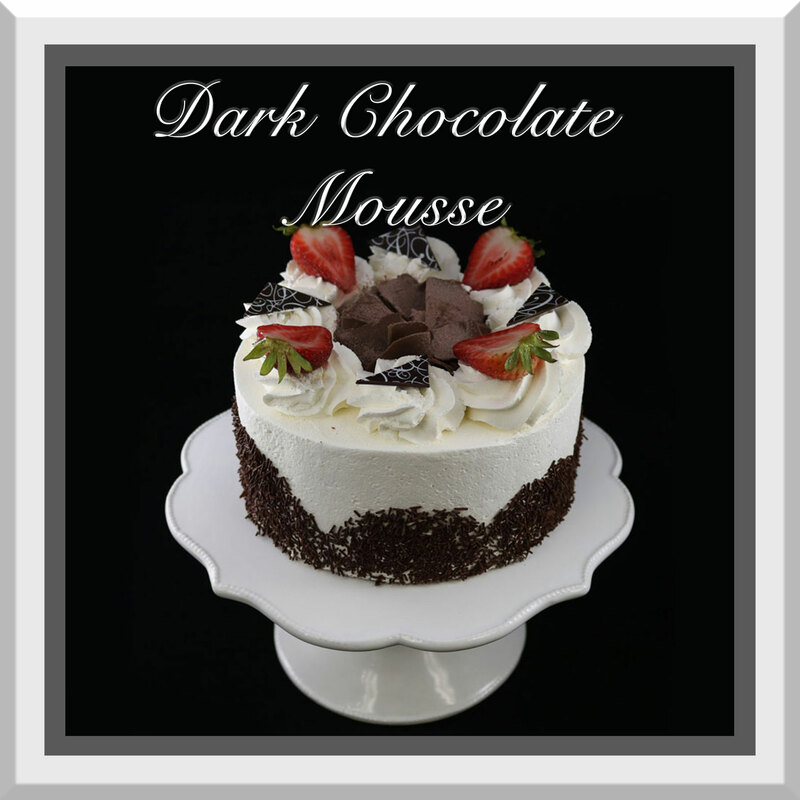 Three layers of chocolate cake filled with dark chocolate mousse. 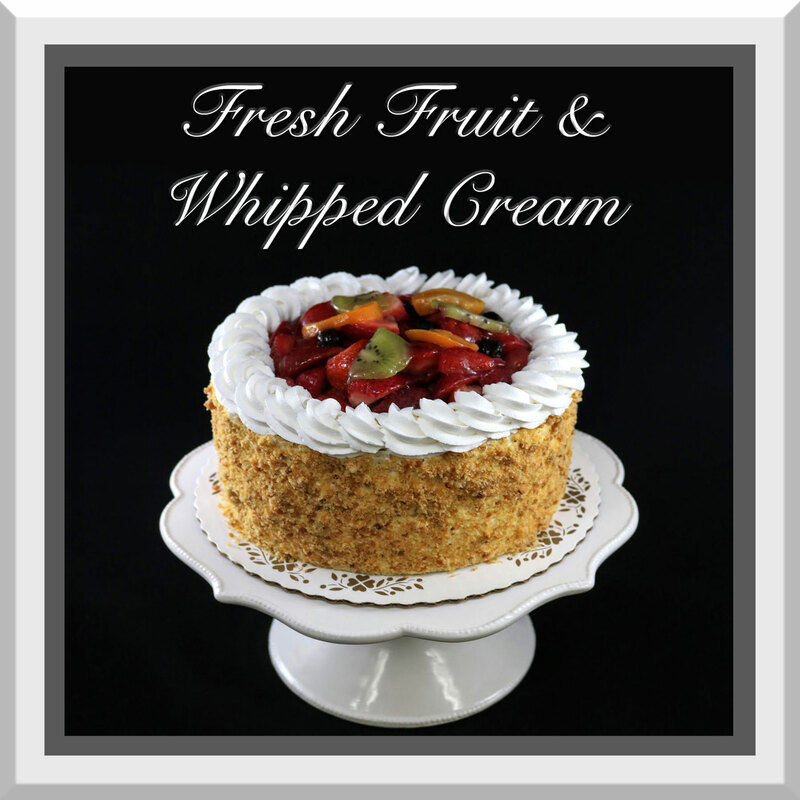 Three layers of vanilla cake filled with Bavarian cream topped with a thin spread of raspberry jam & fruit topping which includes chopped strawberries, diced peaches, sliced apricots, kiwis, and blueberries. 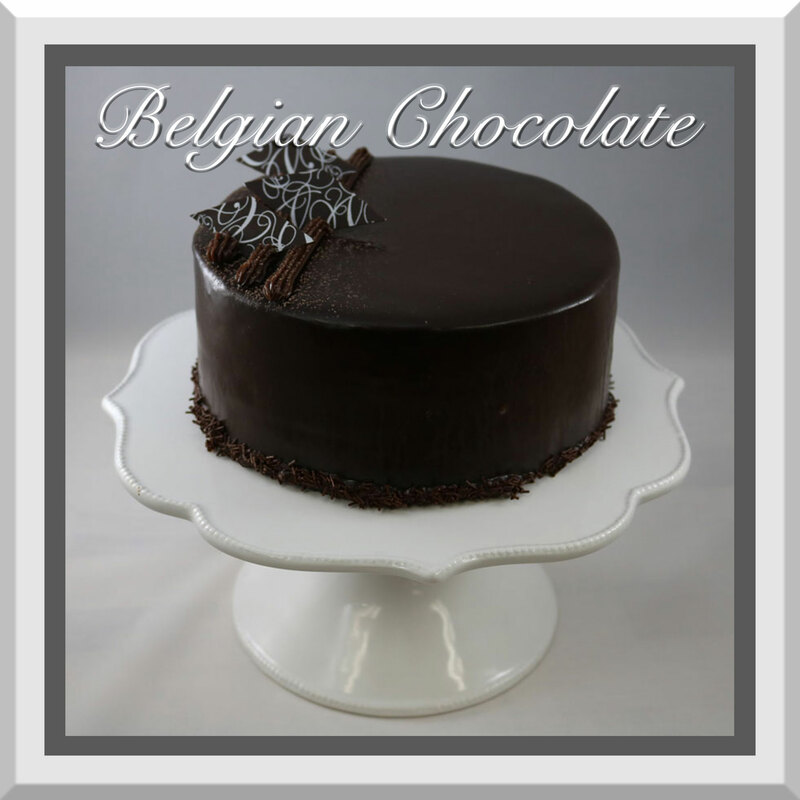 Three layers of chocolate cake filled with our own German Chocolate filling (contains chocolate & almonds). 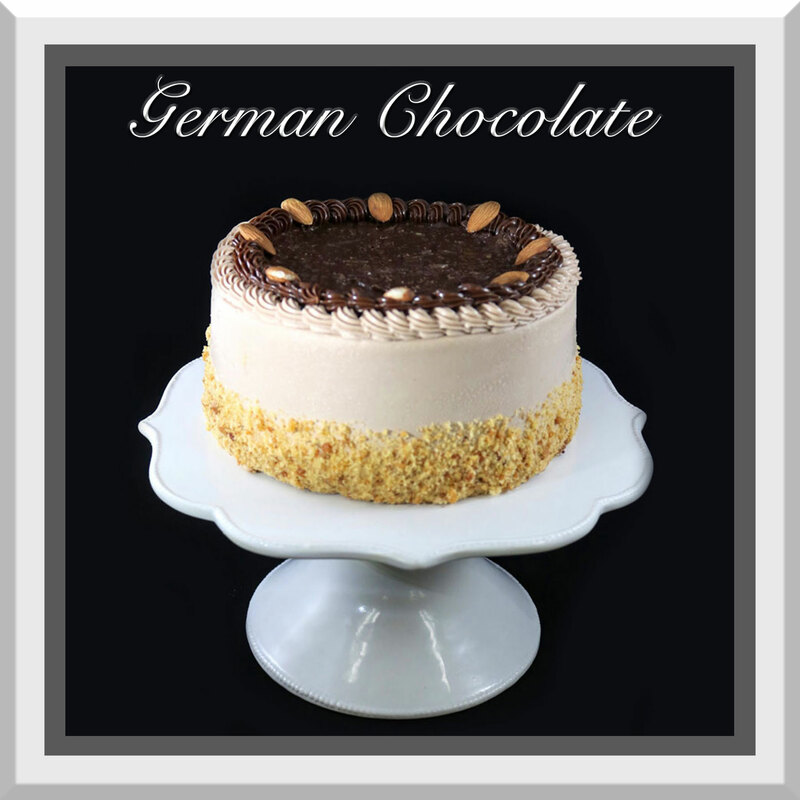 Cake is iced with chocolate European buttercream and decorated with cake crumbs, german chocolate filling & whole almonds. 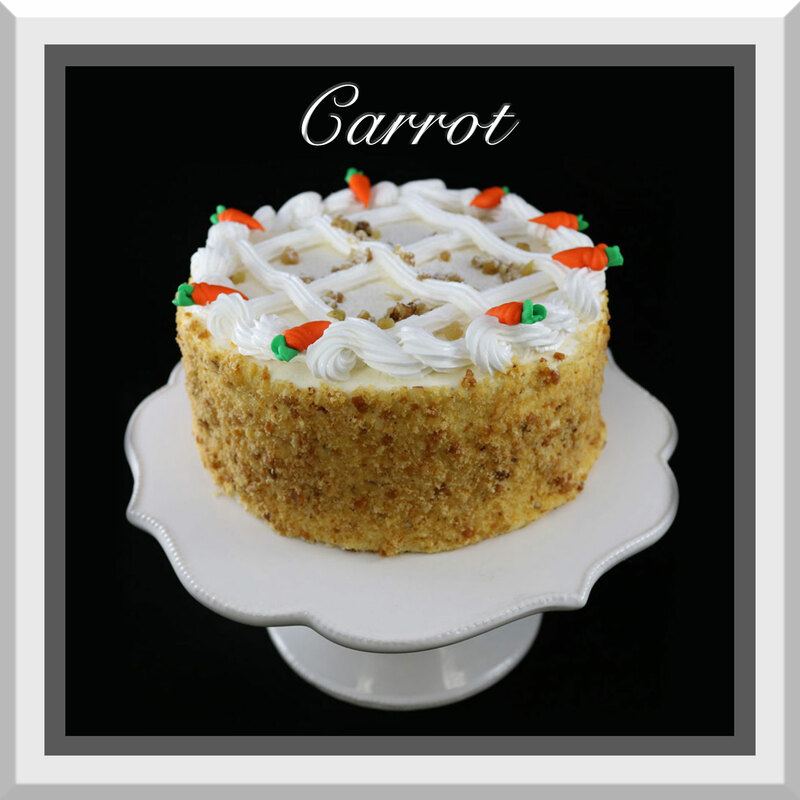 Three layers of marble cake layered with a very light coconut Bavarian filling tossed in some pineapple bits. 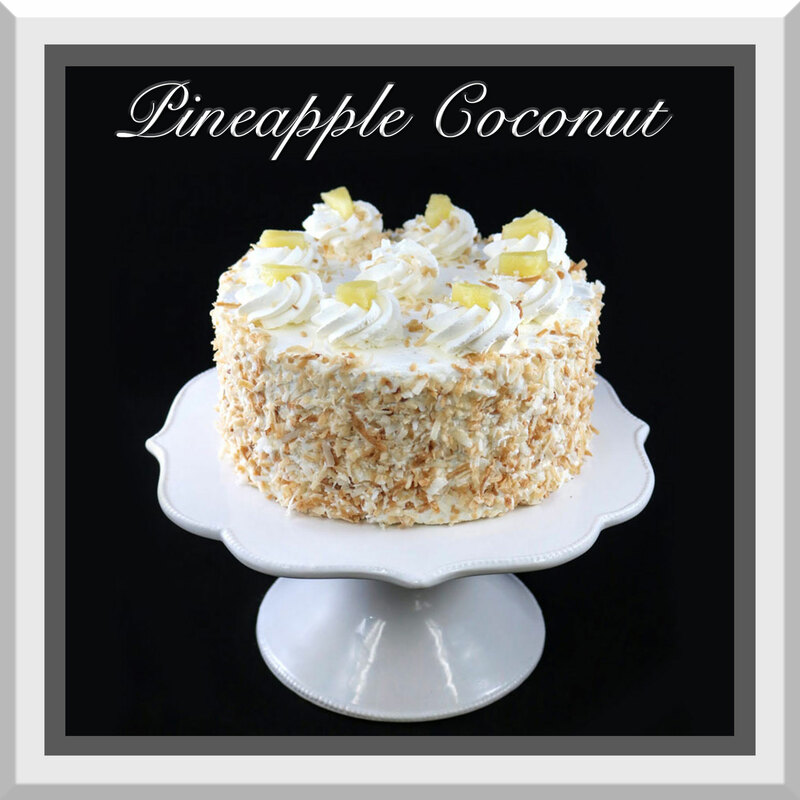 Cake is iced in whipped cream and decorated with toasted coconut & pineapple bits. 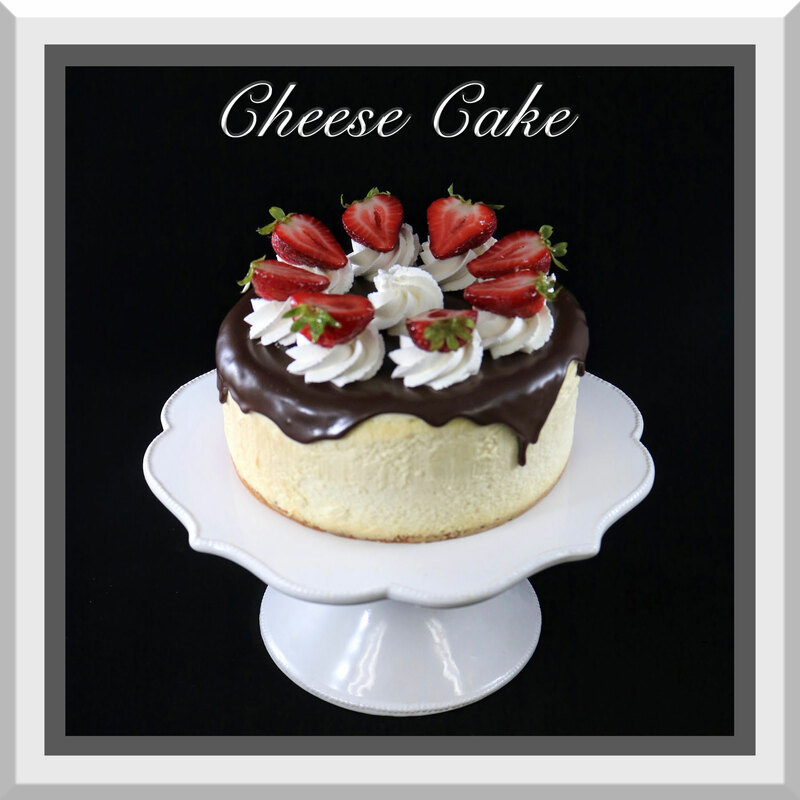 A dome shaped vanilla chiffon cake filled with strawberry mousse and a chocolate cake center. 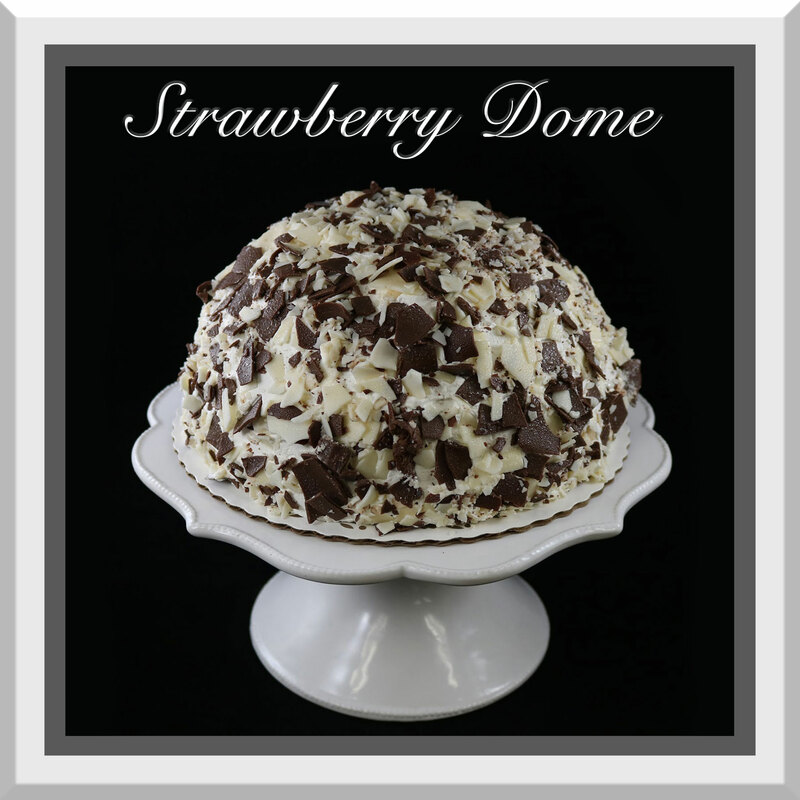 The dome is decorated with whipped cream & white and dark chocolate shavings.